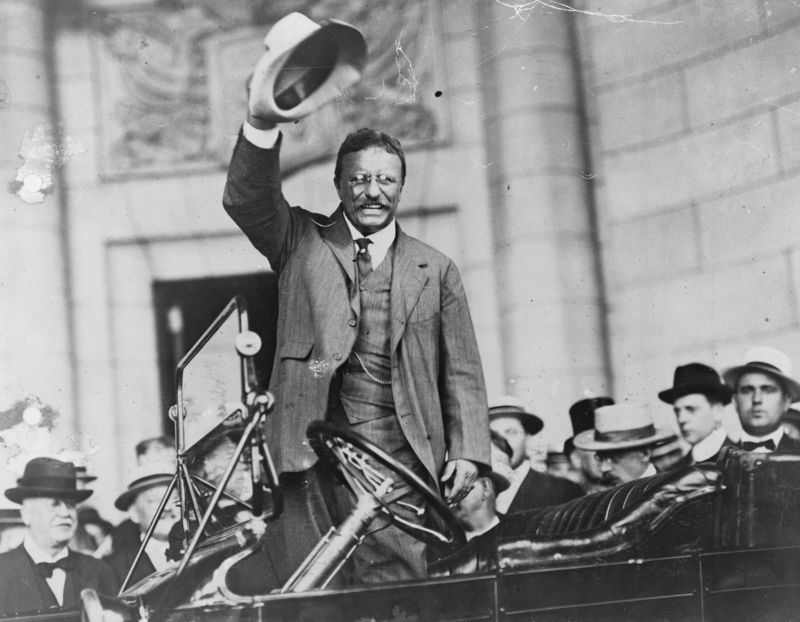 Theodore Roosevelt thrived in the spotlight, and the crowds loved him. Photo courtesy Library of Congress. Unless you’ve been hiding under a rock, you’re well aware that the first episode of Ken Burns’ monumental and much-ballyhooed seven-part series, The Roosevelts: An Intimate History, debuts tonight on PBS (Sunday, September 14, 2014, 8:00 – 10:00 p.m. ET). It goes without saying that I encourage you not to miss it. I guarantee you will be hooked from the start. You’ll marvel at the masterful way Burns and screenwriter/historian Geoffrey C. Ward interweave the complex biographies of Theodore, Franklin and Eleanor and their extended families into the fabric of American history, literally from conception to grave. And you’ll be gripped by the poignancy of their personal challenges and demons and the remarkable resilience and brilliance that drove this family into social, political and environmental reform at the highest and most noble level. Their story is Shakespearean, the stuff of high drama, and it’s certainly not an easy one to tell. After all, there was a Roosevelt in the White House for 19 of the first 45 years of the 20th century. But Ken Burns and his longtime collaborators, including and most especially Geoffrey C. Ward, bring the Roosevelts’ story to life in a way that will engross and inspire you. Although bred within an insulated patrician New York family, Theodore, Eleanor and Franklin each had a gift for seeing the bigger picture, and a passion for tackling the “new deals” born of a new century: burgeoning industrialization, technology and militarism; human rights, economic and land management challenges; and global expansionism. Burns fortifies this “web of ties” with his usual lush mix of extraordinary period footage and photos and commentary by subject specialists (Ward is joined by the likes of Doris Kearns Goodwin, David McCullough and George Will, among other equally esteemed historians and Roosevelt scholars). Intimate and revelatory letters, diary entries, excerpts from the Roosevelts’ books and other writings and sensational news clips and political cartoons are read in voice over by noted actors. TR, FDR and Eleanor are voiced throughout by actors Paul (“John Adams”) Giamatti, Edward (“Eleanor and Franklin”) Herrmann and Meryl Streep, respectively. Their readings are convincing and engaging. In fact, Ms. Streep captures Eleanor’s voice so pitch perfectly that you’ll think Streep is actually channeling the now deceased stateswoman. 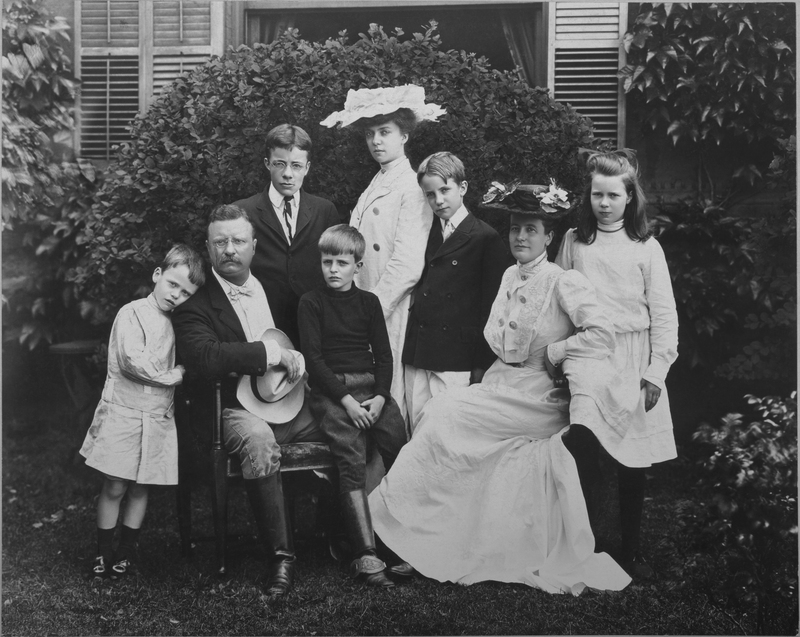 President Theodore Roosevelt’s young, rambunctious family energized the staid White House and captured the hearts of Americans. Photo courtesy Theodore Roosevelt Birthplace National Historic Site. Episode 1: Get Action (1858-1901), Episode 2: In the Arena (1901- 1910) and Episode 3: The Fire of Life (1910-1919), airing Sunday (9/14), Monday (9/15) and Tuesday (9/16), respectively, do not disappoint as they set the stage and flesh out the back story of the New York Roosevelt family tree (FDR was TR’s fifth cousin by birth and nephew by marriage; Eleanor was TR’s niece). Eleanor’s marriage to FDR united, at least on paper, the Republican and Democratic branches of the Roosevelt family. FDR and Eleanor’s early years, talents and travails and subsequent courtship and marriage dance around the predominant subject of the first three episodes: Theodore Roosevelt (1858-1919). A remarkable intellect, naturalist, adventurer, reader, writer, politician and media darling, he met the new century and rose to political power with unbridled chutzpah. 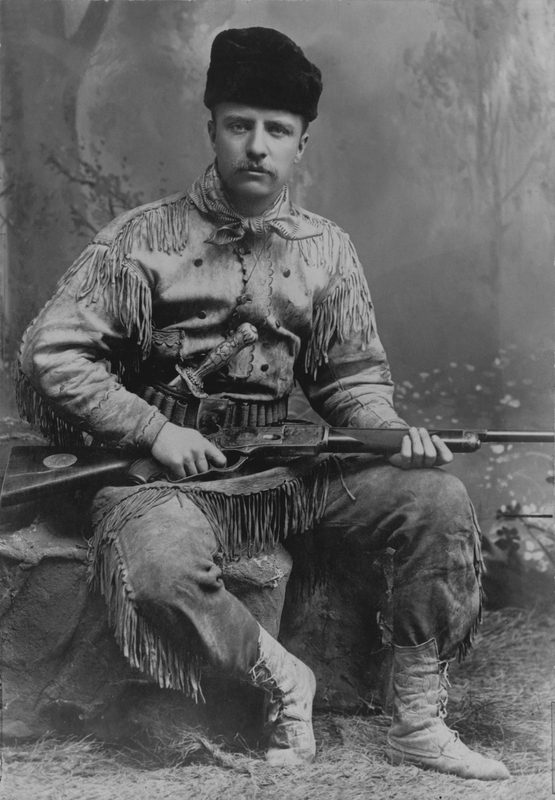 Theodore Roosevelt in his new buckskin suit, circa 1885. Photo courtesy Library of Congress. TR’s life was made for the big screen before the big screen existed. He was not expected to survive his early fragile start in life. His exuberant adventures, international exploits and political and social reforms contrast with his touching love for his wives and children evoked throughout his beautifully written prose and letters. Although he was likened to a kid in a candy store or a bull in a china shop, he apparently did sit still long enough to read several books a day, write and publish critically acclaimed books and some 150,000 letters. He was the first American to win the Nobel Peace Prize; he kept talking for one full hour after he’d been shot by a would-be assassin at a political rally; and, flattened by a 104-degree fever, he survived an Amazon expedition decimated by fire ants and cannibals. 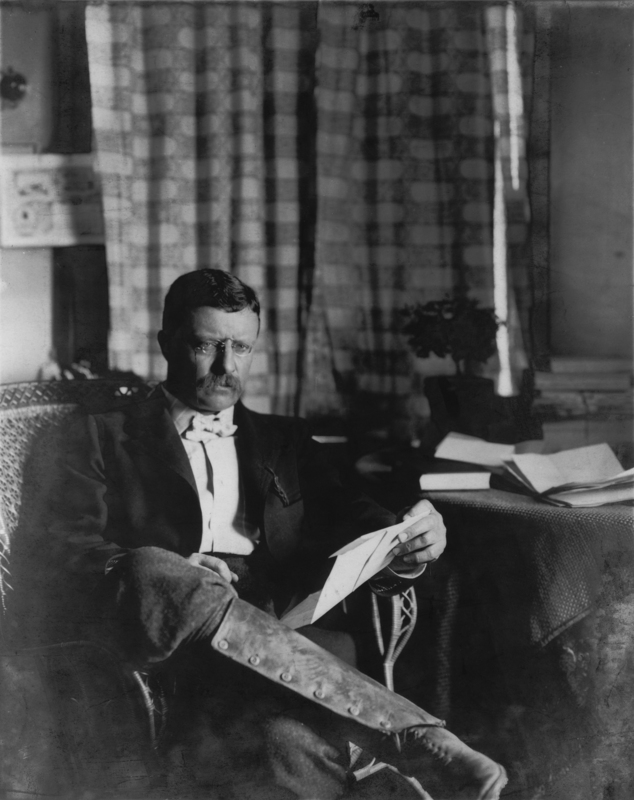 TR knew how to play the media and when he got its attention, he corralled it long enough to win votes and the hearts and minds of the American public. When he made mistakes, they were, like everything else he did…big mistakes. He worked his way up the political ladder on his own terms, yet he seemed to be a remarkable mediator between disparate factions, both at home and abroad. President Theodore Roosevelt in 1903. Photo courtesy Library of Congress. This entry was posted in Film, TV and tagged Eleanor Roosevelt, Family Relationships, Franklin D. Roosevelt, Geoffrey C. Ward, Ken Burns, Meryl Streep, PBS, The Roosevelts An Intimate History, Theodore Roosevelt, U.S. History. Bookmark the permalink.